The third quarter-final of the PDC World Darts Championship sees Raymond Van Barneveld and Michael Smith locking horns at Ally Pally on New Year's Day. Who will reach the semi-finals? 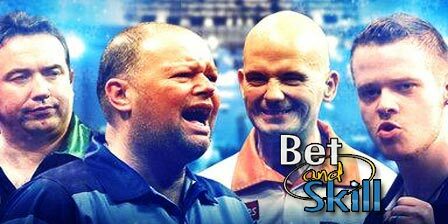 Check out here our RAYMOND VAN BARNEVELD vs. MICHAEL SMITH betting preview with free tips, match predictions, best odds, bookie bonuses and no deposit free bets to play on darts! Raymond van Barneveld beat 4-3 Michael van Gerwen on Monday, producing one his best darting performances for several years as he hit seven 180s and averaged 100.44. He has been a little fortunate to get through the last two rounds winning both of this last matches 4-3 but his performance against MVG make the Dutchman one of this year's title favoruites despite averaging less than 93 in his previous 2 games. Michael Smith has come through against lesser opponents and is likely to find this his toughest so far. He had little trouble in demolishing a decent player in Benito Van Der Pas 4-0 in the last round (hitting twelve 180s in 15 legs) and boast an impressive 99.06 average in this tournament compared with 95.47 for Barney. Meanwhile the checkout success percentages are 43.33 for Smith and 35.45 for RVB. Barney has beaten Smith in every meaningful game they have played so far. Anyway, Bully Boy has won the last three meetings against the van Barneveld by an aggregate of 18 legs to 8. In our opinion, the Dutchman makes fewer mistakes and throws fewer loose darts than his younger opponent. "Raymond Van Barneveld v Michael Smith predictions, tips, odds and free bets (PDC World Darts Championship - 1.1.2016)"